For bicyclists, the rewards from improved physical fitness and stress release to the minimal commuting costs are obvious. So are the risks. Former Gov. 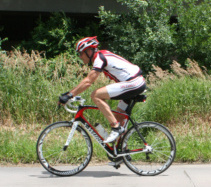 Bill Ritter, an avid cyclist, suffered broken ribs after colliding with another bicyclist on one of his regular morning rides in 2010. Then-President George W. Bush attended his daughters engagement party sporting cuts, scrapes and a bandage on his chin after crashing on his mountain bike on his Texas ranch in 2004. Author Stephen Covey died last year at the age of 79 of complications from injuries incurred in a bike wreck in Utah. 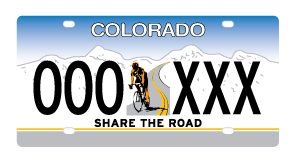 Countless other cyclists have been injured in pursuit of their passion, and high-profile cases of motorists harassing cyclists in Colorado some causing serious injuries or even death have grabbed public attention. Still, promotion of the sport as a healthy, environmentally friendly, fun form of transportation is at a fever pitch with urban bike-sharing programs including Denvers B-cycle program now operating in 29 cities and being planned to open soon in 33 more, and Colorados ski resorts marketing themselves internationally as meccas for extreme mountain biking. Rick Petersen grew up in the Santa Clara Valley riding his bike to school like any ordinary California kid. But it wasnt until 2009, when he was 48, that he started taking cycling seriously. 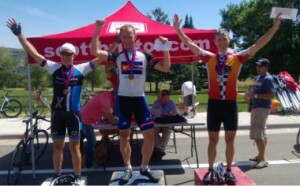 Rick Petersen on the podium Aug. 3 after winning his age group in the Lookout Mountain Hill Climb. He became friends with a couple of neighbors who were enthusiasts Scot Harris, founder of the Elephant Rock century ride, and Brad Tucker, a bicycle racer and an attorney specializing in bicycle-related litigation and he began cycling and training more intensely. Tucker watched him ride and persuaded him to start racing and by July 2009 Petersen already had won three races. He was tapering his training sessions five days before the ultimate challenge the Mount Evans Hill Climb when he was nearly killed in a collision with a drunk driver. He and a friend were riding at Chatfield State Park. Petersen said he was tucked behind the other rider and didnt see the car coming when the driver suddenly swerved. The cyclist in front was able to bail out off the road at the last second, but Petersen was hit hard. I was back on the bike when I still needed the cane to get around, he said. Even when I was in the wheelchair, I was spinning at the rec center. I would maneuver myself off the wheelchair and onto the spinning bike because I wanted to keep some basic level of fitness. 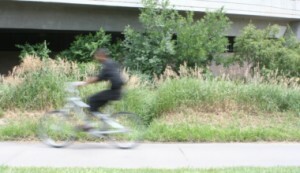 Four years later, Petersen commutes to work by bike between his home in Bow Mar and the downtown offices of OZ Architecture, where he is a principal at the firm. He still races, doing long training rides on weekends and interval training where you wreck your body for a half an hour a couple times a week. Half of the reason I do it is the social aspect, he said. The other half is fitness. And then theres what Petersen calls the freedom part. Thats really fantastic. I choose to commute on my bike to work every morning because its the only part of my life where theres a one-to-one correspondence between my will and the outcome. Its the only time Im in complete control of my actions and my day. Thirty-eight-year-old Andy Carlson has been cycling competitively since he was 12, commutes to work by bicycle and rides for pleasure every chance he gets, but he never had a serious crash until this summer. Ive been super lucky, he said. 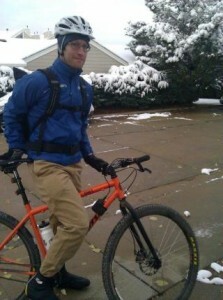 Andy Carlson commutes to work year-round. He was riding with a friend on the Fraser to Granby trail, coming down a single track section where there are water bars crossing the trail. I saw one up ahead and thought I could ride through it, but obviously I couldnt. His body was launched over his handlebars and, though he didnt lose consciousness, it took him a while to realize that hed hit his ribs hard. He rode about a mile and then walked to a road, where a friend picked him up and drove him to his condo to recover. Seven weeks later, Carlson said, Im finally feeling like myself, but the crash has affected his relationship with the sport. I still want to love mountain biking, he said, but Im super tentative now. I like being physically fit, he said. Thats a big thing for me. And, frankly, at this point in my life, riding is something I do by myself. Its me time, a chance for a lot of reflection. Data are elusive on bicycle accidents. The Denver Police Department only keeps records of automobile/bicycle collisions not bicycle/bicycle collisions or garden-variety bike wrecks but the numbers appear to be increasing. B-cycle managers say only two accidents and one injury have been reported since the program launched in 2010. Parry Burnap, executive director of Denver Bike Sharing, said the program provides 720 bicycles but no helmets at 84 B-cycle stations across the city. 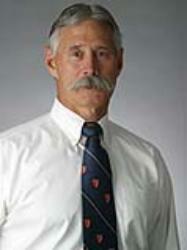 Dr. Ernest E. Gene Moore is a legend in the field of trauma. The head of trauma surgery at Denver Health for 35 years, professor of surgery at the CU School of Medicine and editor of the Journal of Trauma also is an avid cyclist. He commutes to work and between jobs at Denver Health and the Anschutz Medical Campus year-round, through ice, snow, rain and punishing mid-summer heat. The beauty of bicycle commuting is that it makes exercise part of your daily routine, Moore said. I think the more people talk about health, the more they emphasize exercise, but we get busy. We think were going to exercise, but we dont. Im biased in this arena. I do it for my mental health as well as physical health. I think we should make physical exercise a priority every day. At 67, Moore describes himself as reasonably fit, though thats clearly an understatement. He did the grueling Triple Bypass bike ride again this summer and is a nationally-ranked triathlete. Still, he doesnt minimize the risk. Hes been called upon to treat seriously injured cyclists who arrive at the trauma center. Ive seen many people die on a bicycle and Ive seen very serious injuries, he said. Theres no question, if youre in the wrong place at the wrong time, youll get killed on a bike. I dont think people realize how unprotected you are and how fast youre going. I always assume someones coming after me, he said. You have to assume the people are distracted and cant see you. You have to be a careful rider on your bike. I just discovered Emerson Street, Moore said. Its right in the middle of Denver and often its totally vacant. I ride that in the winter and theres rarely a car on it. Ive had some close calls where people have not stopped at stoplights or stop signs, he said. And there are always those lunatics who try to run you over because they think bicyclists dont belong on the streets. Moore said a driver in a pickup swerved to hit him with his side mirror and, fortunately, only delivered a glancing blow. Other motorists have run him off the roads into bushes, and a driver on a cell phone hit him hard enough to break his bike in two, though he wasnt seriously hurt. 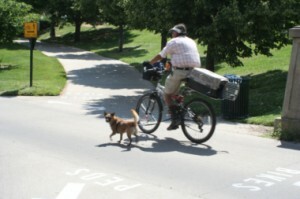 Still, he said, 95 percent of the motorists in Denver are incredibly bike-friendly. They go out of their way to accommodate you. A lot of times we think of bikes like cars if you put more and more cars on the road, the number of crashes goes up, Grunig said. But if there are more bicyclists, the rate of crashes goes down. The need for those is most important in high-conflict areas, such as intersections where the potential for crashes is great. Its a great way to invest in safety. The improvements are very cheap. Going east and west in Denver is OK. The city has some beautiful biking trails. But going north and south is a disaster, he said. The citys bike trails, especially the Cherry Creek Trail, are so crowded in the summer, they present dangers all their own. The mismatch is outrageous, he said. You have people stumbling around, talking on their cell phones, and a sprinter going 30 mph on a bike. I train all the time, but if you want to train, go to Lookout Mountain or Chatfield. You shouldnt be doing that coming into downtown Denver on the Cherry Creek path. Portland, Ore., and Vancouver, B.C., are among a handful of cities that have pioneered the development of bicycle boulevards with great success, Grunig said. A bicycle boulevard is usually a neighborhood street with low traffic volume that runs parallel to a heavily-traveled arterial. Medians are installed every few blocks to drive motorists to other streets; sharrows (shared-lane markings) are painted on the pavement; and signage is prominent to clearly designate the street for cyclists. Carlson has biked in Portland and other cities and said one big problem with Denvers bike routes is that they havent been completely thought-through. In Portland and Minneapolis, they get why its important. They design bike routes a little more holistically, putting them in places where people are going to use them and doing things that discourage cars from being on those roads. The Cherry Creek Trail gets heavy use, especially near downtown.After all, there wasnt a stop sign invented until there was a car, he said. Theres a mentality that roads are designed exclusively for cars, but in reality, public roads are for all people to use to get around. Theres a real building awareness of the wave of change thats coming as the car culture is in decline, Grunig said. The number of vehicle miles traveled has been down for eight or 10 years in a row. Some motorists will tell cyclists to get off the street and get on the sidewalk, he said. Others ignore cyclists at intersections, run them off the streets and onto the shoulders, and harass them verbally. We need to educate drivers on how to respect cyclists, Sauaia said. Petersen said he frequently encounters problems with motorists who dont understand the law. Recently he was riding through a tunnel at the underpass at 38th and Brighton Boulevard, and a motorist behind him began honking furiously. As they emerged from the tunnel, the driver yelled, Use the – sidewalk, you – idiot. I yelled back at him, Its illegal, said Petersen, who admits that he wanted to say a whole lot more to the guy. Theres a common misperception that bicycles shouldnt be on the road. Still, Petersen said that cyclists are our own worst enemies. I always stop at stoplights and its really rare that bicyclists do that in the city. Its one of the most hypocritical things. Its ridiculous when cyclists complain that they dont have the respect of motorists on the road when theyre not abiding by the rules. Bicycle commuting can be an important part of a companys wellness program. He said that studies have shown cyclists take fewer sick days, are more productive and cost a company less for health insurance. It also has a real economic benefit for the business community. Cyclists spend more money along their commuting routes than drivers do, he said. Theyre more likely to stop at a business along the way to pick up groceries or meet a friend for a drink or a meal. If youre driving, youre just passing through, he said.